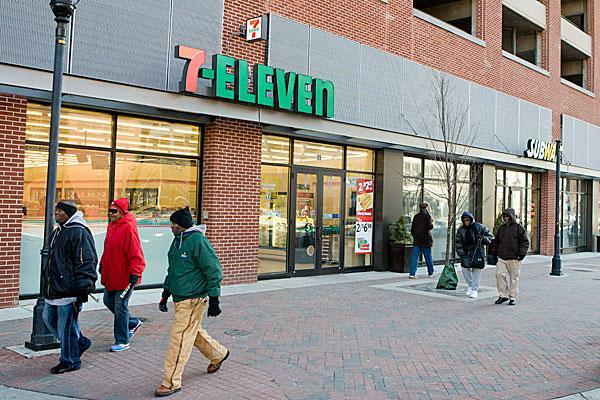 7-Eleven stores were raided today in N.Y. and Va., after several owners were accused of trafficking illegal workers into the United States. “One of the world’s largest convenience store chains just took a Big Gulp. According to the New York Times, twelve Long Island 7-Elevens were raided this morning by the Department of Homeland Security, on the heels of nine proprietors and managers being accused of human trafficking, identity theft and money laundering. It is believed that the franchises were being staffed by illegal-immigrant Pakistani workers, Fox News reported. Fourteen stores in total were raided, including locations in Virginia, the Times said. The investigation could eventually reach New York City as 40 more stores are also under investigation, the Times reported. U.S. Attorney Loretta Lynch told the Associated Press that the accused “not only systematically employed illegal immigrants, they concealed their crimes by raiding the cradle and grave to steal the identities of children and even the dead.” The illegal workers were paid via fraudulent social security numbers, including one of an employee that hadn’t been on the store’s staff in a decade, and at this time, the number of illegally smuggled workers in custody exceeds a dozen, according to the AP. 7-Eleven issued a statement today from its corporate headquarters in Dallas, passed on by the Dallas Morning News, in which the chain acknowledged the situation, but also said that it “will have no further comment until we learn more.” The Huffington Post added that approximately 20 total people were arrested before the afternoon.